Arlington Soccer Association’s U16 Boys team today won the US Youth Soccer National Championship in Frisco, TX. 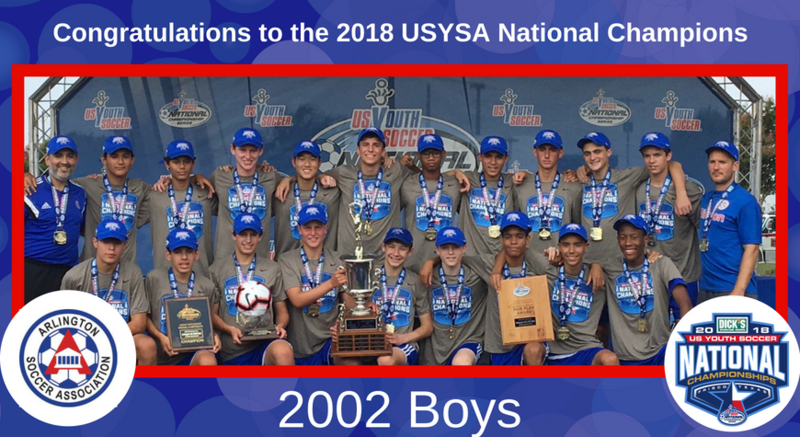 The tile is the first USYS Championship in the club’s history. The team, led by head coach Osman Cuadros and assistant coach Chase Bruggeman, bested NCFC Elite from Raleigh, NC with a 1-0 win. The goal in the 95th minute of overtime was scored by Brandon Johns with an assist by Diego Ochoa. The team also were the recipients of the US Youth Soccer Fair Play Award, as selected by referees and the US Youth Soccer National Championships Committee, are recognized for displaying positive conduct on the field toward their opponents and game officials throughout the competition. The title caps off Arlington’s most successful year in its almost 50-year history with the U14 Girls team also advancing to the National Championships. The girls, led by head coach Mo Tayari and assistant coaches Alexis Koppius and Elizabeth Oden, represented the first girls team from the club to ever advance to the national championships capping off a historic run including clinching the Eastern Regional League Championships and a 2nd place, undefeated finish in the USYS National League. Other accomplishments for Arlington this year include the Super Y National Championship title for both the U14 and U15 girls teams, five Virginia State Champs (U12, U14, U15 Girls and the U14 and U17 Boys) and all five teams and the U16 boys competing at the Eastern Regional Championships held in Fredericksburg, VA in July.